Lee Duncan had an unhappy childhood. Deserted by a father who left his son a legacy of unrealistic dreams and a future in an orphanage, he invested his love and trust in dogs. Even then, he seemed doomed to lose. Circumstances beyond his control made him give up at least one beloved companion at a young age. What a surprise, then, that the battlefield gave him his greatest gift. "Orlean...spent 10 years researching and writing THE LIFE AND LEGEND, trying to make sense out of how one man took one dog and made him into the most well-known canine in history." As a soldier in France, Duncan happened upon a bombed-out kennel. Among the slaughtered animals was a whimpering mother with a small litter. These tiny creatures may have been what brought Duncan through the war alive. They certainly must have been what kept him focused, for he could barely stand to be separated from his dogs. After the war ended, he made it back home with Rin Tin Tin and his sister, Nanette. There he set out to take Rin Tin Tin from foundling to movie star. Duncan, the pup’s savior, was so passionate about his dog that he pestered movie producers until he found one willing to give Rinty a chance. 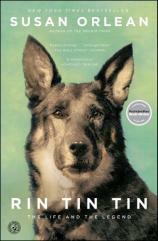 In RIN TIN TIN: THE LIFE AND THE LEGEND, Susan Orlean takes a look back at how that puppy that miraculously survived the battlefields of World War I became a hero. Of course, the original dog didn’t survive the numerous decades that Rin Tin Tin movies and television episodes aired. None of us as children wanted to believe that our favorite film dog wasn’t just one phenomenal animal. But it was his character that endured, as well as his bloodline. Duncan saw to that. Duncan came along at a time when people needed desperately to believe in a moral world, on the heels of a monstrous war. Emotions were running high, and Americans craved entertainment that showed good triumphing over evil. He could give audiences what they wanted. Even better, Rin Tin Tin reputedly was a true wonder, able to leap to fantastic heights and act better than many of his human counterparts. We are fortunate that Duncan had such a love for dogs that he risked his life and freedom to save a litter of days-old German shepherds. One of those pups grew up to be the legend of Rin Tin Tin. We are fortunate, too, that Duncan bred generations of little Rintys, to the continued benefit of moviegoers. To an extent, we are fortunate to have the memorabilia that Duncan left behind, for his widow cared little for any of it, entrusting it to a neighbor until she could figure out what to do with it. However, not being one of her priorities, she eventually abandoned it. The person who discovered it all understood the enduring value, having grown up watching Rin Tin Tin. There is still a Rin Tin Tin fan club, nearly a hundred years after he was born. His descendants remain highly sought after to this day. In fact, Orlean admits her own desire to have a Rinty pup. She spent 10 years researching and writing THE LIFE AND LEGEND, trying to make sense out of how one man took one dog and made him into the most well-known canine in history. Baby boomers will eat this up, and then pass it on to their children and grandchildren, who will do the same. After all, it’s about Rin Tin Tin.